Fans who frequent Joseph P. Riley, Jr. Park on a nightly basis hear the crack of the bat, the roar of the Charleston faithful and the laughter and joy that permeates the air. In another part of Charleston, there exists another game for those who will never play in the big leagues, but the enthusiasm and teamwork that persists makes this a league where dreams become reality. The Charleston RiverDogs most recent monthly volunteer project involved an afternoon spent with the Charleston Miracle League, which gives children and adults with special needs (i.e. mental and/or physical challenges) the opportunity to play baseball, for free, in formally organized league at a state-of-the-art complex in the City of Charleston’s Forrest Park Playground located in West Ashley built specifically for them. The heart of this complex is our specially designed, rubberized-surface Joe Griffith Miracle Field, which allows players to fully participate regardless of their challenges. In addition, our complex boasts a fully functional concession stand, press box, covered picnic pavilion and handicap accessible restroom suites complete with lifts. Covered stands with viewing platforms ensure that everyone, regardless of his or her abilities, can enjoy watching a Miracle League game. In addition, the CML is a 501(c)3 non-profit organization that teaches volunteers of all ages, who typically serve as buddies for our players, the value of giving back to others and their community. The Charleston Miracle League also engages in a yearly partnership with the Cooper River Bridge Run called “Bridging the Gap Through Baseball.” Interested participants may sign up for the bridge run as a representative of the league with 100% of the proceeds raised from this going directly to helping the Charleston Miracle League fund their Youth and Adult league programs. For 2010, the Charleston Miracle League has been selected as one of the official 2010 Cooper River Bridge Run charities. For more information about the league or to donate or become a volunteer, visit the league’s website online at www.charlestonmiracleleauge.org. For the past 11 years the Florida Marlins and the Florida State League have paired up to fund the Florida State League Scholarship Program. The purpose of the program is to encourage and reward school-aged applicants with $1,500 scholarships, sending them a message that education is the key to success in life. Since the inception of the program, over a 120 scholarships have been awarded. If you would like to donate to the Florida State League Scholarships please call 305-623-6497. The Indianapolis Indians are proud to announce that their mascot Rowdie, along with a team of actors from the Actors Theatre of Indiana, is currently participating in the second season of the educational program “Rowdie: Home Run for Health”. The play is designed to entertain and educate elementary school students on the “bases” of scoring a healthy home run in the game of life. The play’s script pays special attention to three key areas of a healthy lifestyle: nutrition, exercise and personal hygiene. Indianapolis Indians Community Relations Manager Ryan Bowman expressed that the play acts as an add-on for the information students are already learning. This program evolved due to the need for improved awareness of childhood obesity. After speaking with local elementary school officials and parents, the staff behind the play learned that many school districts rated child obesity as their biggest challenge to overcome in their schools. The 25-minute play plans to journey to more than 30 Indianapolis-area schools, with the final performance to be held on Thursday, April 1. Aside from a free viewing of the show, each student also receives a multi-page Rowdie Fun & Fitness Activity Book filled with great activities and games promoting the play’s message of a healthy lifestyle. The show itself includes a hand-created Victory Field backdrop accompanied with its very own flip down food pyramid. The play also features many baseball themed song and dance routines such as “Food for Thought” and “Let’s Get Some Exercise”. A “radiothon” staged by the Lexington Legends and the LM Communications radio group raised $8,200 in donations to Big Brothers/Big Sisters of the Bluegrass. LM’s Lexington radio stations presented special segments highlighting the BBBS program Friday, February 26 from noon to 8 p.m. and Saturday, February 27 from 10 a.m. to 6 p.m. The live broadcasts originated from Fayette Mall in Lexington and featured LM personalities as well as Legends representatives. Listeners were invited to call and make donations to BBBS, and the Legends donated 50 percent of any baseball ticket sales made during the radiothon to BBBS. The LM group’s Lexington stations include WLXG -1300 AM, WLXO – 96.1 FM, WBVX – B92, WGKS- KISS FM 96.9, WCDA – Your 106.3, and WBTF, The Beat 107.9. The Legends and LM communications have been partners for Legends game broadcasts throughout the team’s history, with WLXG serving as the Legends’ flagship station. This year, the primary focus for the annual pre-season radiothon shifted from the sale of season tickets to the support of BBBS. Big Brothers of Lexington was chartered in 1957 as a non-profit corporation in Kentucky to serve boys from single parent homes. Big Sisters was added in 1977, and today the agency is known as Big Brothers Big Sisters of the Bluegrass, Inc. The organization’s mission is to create and support relationships that provide consistent, positive, one-to-one interaction between a single parent child and an adult volunteer who will be an advisor and friend on the journey from childhood to adulthood. The Lowell Spinners, Class-A affiliate of the Boston Red Sox, held a special fundraising event at LeLacheur park Thursday, February 18 to benefit the Merrimack Valley Convention and Visitors Bureau, who have seen a 70 percent slash in their funding and 90 percent of their staff cut in the previous months. The Spinners opened their gates on a cold February night allowing patrons an all-access behind the scenes pass rarely given to the general public. 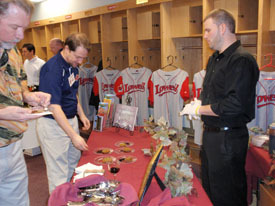 Fans were granted access to the Spinners front offices, clubhouse and locker room for a night of wine, food and beer tasting not soon to be forgotten. Wine vendors organized by Tutto Bene of Lowell sampled their product in the clubhouse once called home by everyone from Jonathan Papelbon to Kevin Youkilis, with jerseys hung in each stall. 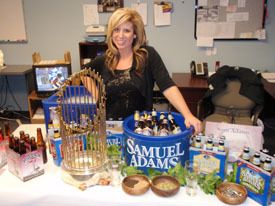 Beer samples were provided by Merrimack Valley Distributors, allowing fans to sample the newest products from Sam Adams, Ipswich Ale and Longtrail Ale, with additional wine provided by Celebrity Wines, including pinots represented by Red Sox stars including David Ortiz and Youkilis. The office typically manned by Spinners manager Gary DiSarcina was turned into a relaxation hotspot as the ladies from Body Destinations in Tewksbury offered complimentary chair massages. In the Spinners conference room were the stars of the night: the 2004 and 2007 Boston Red Sox World Series trophies, ripe for photographs. With tickets sold for $50 each and a silent auction of sports memrobilia, the event raised over $6,000 for the CVB in their time of need.